I love this poem by Joy Mead, who has generously given me permission to reproduce it here. I think it’s especially comforting at this dark time of year when we’re all (in the northern hemisphere!) awaiting the return of the light. trembling creation, dancing in love. wisdom for life where beauty astounds. known in the depths of our mothering earth. Joy is a member of the Iona Community and the author of several books including ‘The One Leaf’, ‘Words and Wonderings‘ and ‘A Way of Knowing‘, all published by Wild Goose Publications. She has been involved in development education and justice and peace work, and occasionally leads creative writing groups. That’s stunning; it stops you in your tracks, wherever you were going. Yes! Likewise – it made me stop and take a deep breath and reflect. Real earth connection! Thank you for your kind comment. That’s lovely, it has a kind of magic about it. Don’t hear much from the trees this time of year, what with trying to keep the cold out. But reading this I could hear them in my mind. I should take a moment to listen more often! I have received your book. Hope to get started on it soon. I think the trees are always talking to us whatever the season! 🙂 Thank you, Pat! Glad you’ve got the book, and hope you’ll enjoy it. Thanks for posting the poem; it is indeed magic. Very beautiful light in your picture. the hazel for wisdom – is that why you chose the hazel tree for your blog, Jo? 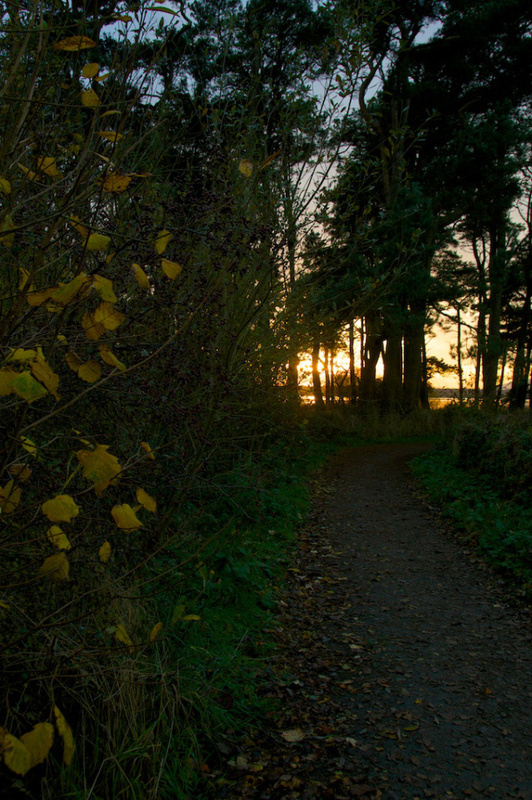 I love the magical light at this time of year – (keep seeing a deer at the end of the path in your photo! thanks for sharing. It is, kind of, Marie! I’ve always loved hazels. I love that you can see a deer in my photo – I’m always on the lookout for them. 🙂 Most welcome, glad you enjoyed the poem as much as I do! I’m glad you like it! Thank you, on behalf of Joy! I am glad you brought that to our collective attention…..judging by the previous comments it has appealed to many of us. It certainly has, David! Thank you. Barb, you’re sharp-eyed – thank you! It is ‘sensations’ and I take full responsibility as I typed it out! Have put it right now. Thanks for your appreciation of this lovely poem.